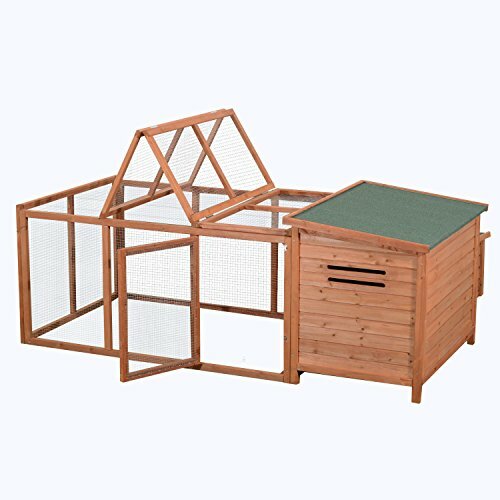 This deluxe chicken coop gives your chickens the ability to move seamlessly from a comfortable enclosure to an outdoor protected space. The indoor facility includes multiple roosting poles and a large nesting box that is able to hold multiple chickens. A small entrance with a travel ramp allows your chickens to run in and out easily, without being wide enough to let the elements in when the weather is bad. This attaches to a wide open fenced enclosure that allows them plenty of room to move around. The roof is split into multiple segments so the roof may be peaked, closed or completely opened up. This is a perfect unit for someone who has a few chickens, but still needs to minimize the space that the coop will be using. FEATURES: - Living / nesting quarters with attached outdoor run for maximum space, - Easy access ramp for pets to enter sleeping area, - Durable mesh to keep pets in and other animals out, - Multiple doors for easy access to animals, - Durable treated wood finish, - Assembly required, all necessary parts included. SPECIFICATIONS: - Overall size: 57"W x 87"L x 32"H, - Living Area: 42"L x 25"W x 32"H, - Egg box size: 15"L x 20"W x21"H, - Run Area size: 59"L x 40"W x 29"H, - Wood thickness: 10 mm, - Net Weight: 92.4 lbs. NOTE: Buyer to determine the amount of pets that will fit in the coop. If you have any questions about this product by PawHut, contact us by completing and submitting the form below. If you are looking for a specif part number, please include it with your message.